You’ll definitely hear more about SouthWest Writer’s exciting invitation from the South Broadway Cultural Center (SBCC) to help create a city-wide literacy center at that beautiful installation. Celebrating that possibility, members are invited to participate in the Premiere SWW Author Reading at the SBCC on Saturday, November 15 at 10:00 a.m. There’s plenty of off-street parking behind the building, and entrance is free. Everyone is welcome to attend. SWW members are invited to participate by reading their fiction, nonfiction or poetry, published or not, as long as it is family friendly. If you read from a published work, Bookworks will stock copies of it at the Reading, provided time permits. The Storyteller’s Anthology will be available as well. Readings will be ten minutes maximum in length, limited to two poems by the same author. Please rehearse to make sure you won’t be hauled offstage by a large hook. All applicants will receive email responses stating whether or not they are accepted. Plan to attend! This Reading is the first event SouthWest Writers will sponsor at the SBCC. It could be a landmark, bragging-rights event. 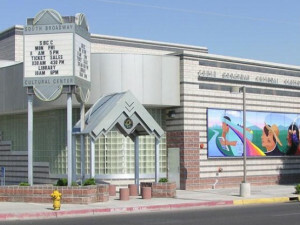 The SBCC is located at 1025 Broadway Blvd SE, Albuquerque, NM 87102, 505-848-1320.